I mean, most of them aren’t new by any stretch… so maybe let’s call them repackaged diets. But as long as it’s trendy and getting press, I’m gonna juice whatever refuse I can find on my back patio for the sake of checking some dumb box. I mean, whether it’s eating only orange foods (Ranch is okay as long as it’s stuck to a carrot, right? ), shunning meat (just kidding – I’d never), “eating” things only if they can be sucked through a straw, or eating only things that were available before the creation of spoken language… I’ll give anything a try once. Just for the heck of it. I live in Katy, Texas, where the “need” for scarves is maybe 10 out of 365 days in a “cold” year. I have more than 10 scarves. And that’s where these sandwiches come in. My friend Brandi bought an Instant Pot – it’s an electric pressure cooker that does a bunch of other things, too. The very next day, I showed up on her doorstep with a 4lb pork roast, a Dr Pepper, a bottle of Gatlin’s barbecue sauce, and a package of Hawaiian rolls. We seared the roast right in the pot (a dream of mine! ), set it to Pressure for 90 minutes, and by the time we had made a dent in the cheese plate and a couple of bottles of wine, it was dinner time. Dinner that tasted like it had cooked for 8-10 hours. I was sold. Sooooo sold. Like, ordered-one-for-myself-sitting-right-there-on-her-couch-eating-a-pulled-pork-slider, sold. 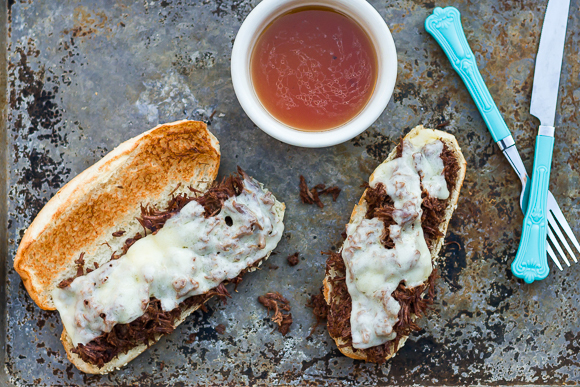 And now that my shiny new pressure cooker is here, I decided to give it an inaugural spin on one of my (and your) all-time favorite slow cooker recipes: French Dip Sandwiches. In the slow cooker, we’re talking 6 hours minimum. In the Instant Pot? 10 minutes of prep, 40 minutes of cooking at pressure, 15-20 minutes of resting, and another 10-15 minutes to shred the meat and build sandwiches. 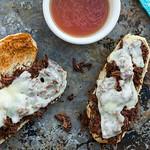 Pressure-cooked French Dip Sandwiches au Jus - the same slow-cooker tenderness in a fraction of the time. Cut the roast in half and liberally salt and pepper the top and bottom sides. Set the pot to Saute and heat 1 Tbsp oil. Sear 1 piece of roast at a time, ~3 minutes on each side. Move to a plate when done. Add the sliced onions and the garlic and cook until softened. Add the two halves of the roast on top of the onions. Stir together the stock, soy sauce, fish sauce, water, Worcestershire sauce, and creole mustard. Pour over the roast, lock the lid in place, and set the vent to Seal (not Vent). Set the pot to High Pressure for 45 minutes. After the pot beeps to let you know the cooking cycle is done, it will take another 15-20 minutes to "naturally" release the pressure (the cylinder next to the vent will drop, indicating that it is done). Shred the meat and build the sandwiches. Strain the liquid and discard as much of the fat as possible (I have a "gravy defatter" that works pretty well - leftovers are even easier because the fat will solidify on the top and you can just scoop it off the next day). 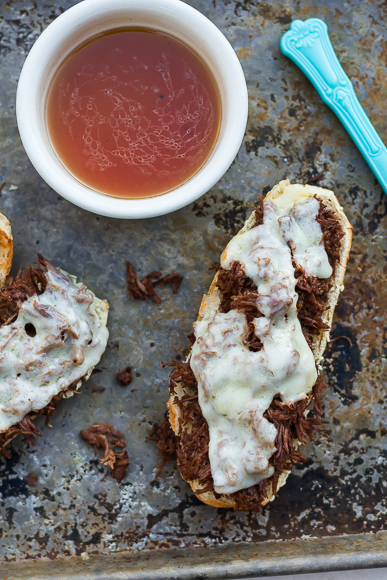 Serve a small bowl of the drippings on the side of your sandwiches. I don’t have a pressure cooker…how long and at what time could I cook this in the slow-cooker? WHAT?! 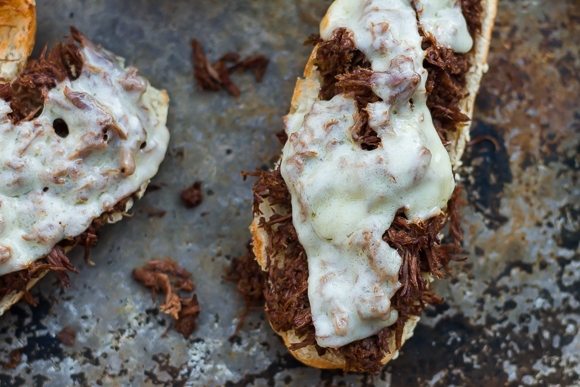 ummm now I feel like i need a pressure cooker because I am impatient and the idea of these amazing sandwiches in 1.5 hours (as opposed to 8) is LIFE CHANGING! I am super geeked about it. Pulled pork cooks perfectly in 90 minutes. You don’t even have to run to the grocery store to buy the roast until like 4pm! Suuuuper geeked. I have to try this!! I have a pressure cooker as a wedding gift 5 years ago and have never used it because I have no clue what to put in it. I hope you post more recipes using the pressure cooker 🙂 Thanks! I can’t wait to add this to my menu next week. I have had an Instant Pot for a few years now (since Nom Nom Paleo sang its praises) but it has ended up in the kitchen appliance graveyard. This recipe will help me resurrect this appliance. It’s probably my most underutilized tool. I’d love to see more Instant Pot recipes on your blog. I haven’t found too many Instant Pot recipes for the that have been very flavorful or worth re-making. This looks like a sure winner. It will help ease my cravings for Portillo’s Beef Dip in Chicago! THANK YOU!